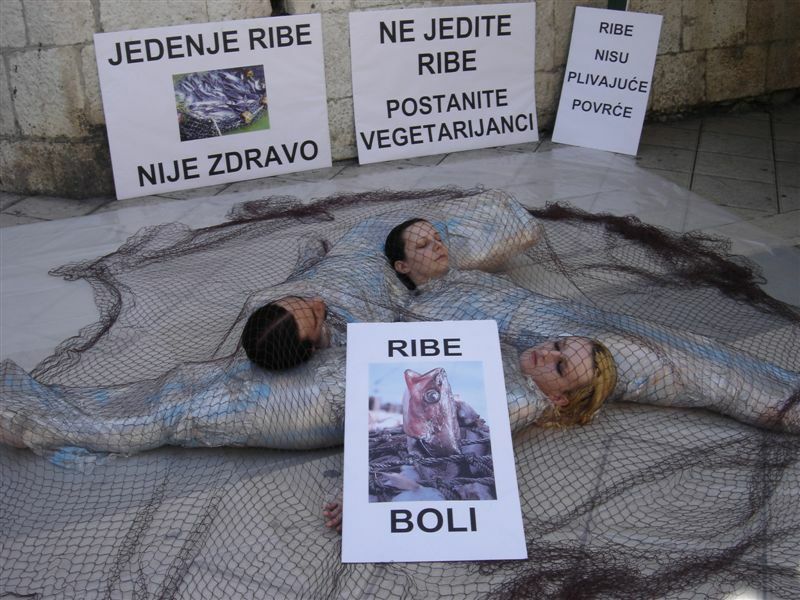 - Animal Friends appeals to the citizens of Split not to eat fish! 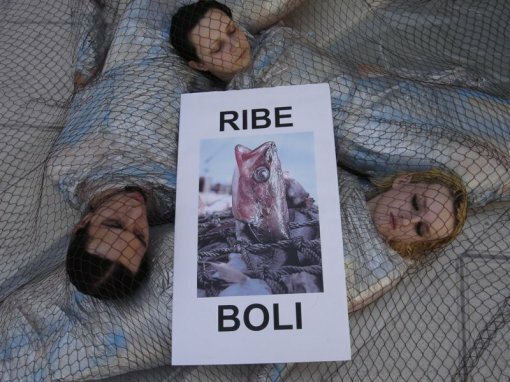 Animal Friends, "entangled" in fishing nets want to symbolically demonstrate the suffering of fish from suffocation after they are pulled from their natural habitats with fishing nets to their death, which may last for days and even weeks. 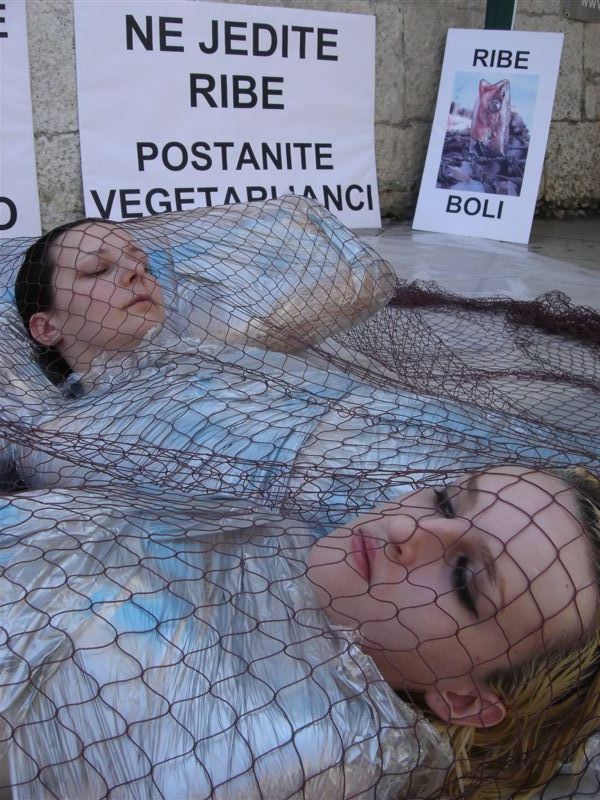 Animal Friends' activists will held a performance on Friday, July 10, 2009, at 11 A.M. in Marmontova ulica in Split, accompanied with the information stall. Fish are sensible beings who form mutual bonds and have the ability to feel pain and fear, just like humans, dogs, cats, and other animals do. Billions of intelligent, complex animals are killed with little or no understanding for their suffering. Fish are speared, squeezed or butchered in order to cut out their intestine while they are still fully conscious. Nobody acknowledges the agony of fish, those sensible animals are reduced to "swimming vegetables" whose value is measured in tons. Their living habitats are mercilessly devastated, and the number of individually killed animals is beyond our comprehension. Fish do suffer very much when they are caught and killed for their meat. No matter whether they are hooked or netted, fish feel fear just like we do. Regarding the ability to feel pain, fish are equal to dogs, cats, and all other animals. Together with other accidental victims, including dolphins, birds and turtles, fish are caught and squeezed for hours with rocks, coral, and ocean debris in enormous bag-shaped nets (trawlers). When hauled out of the water, surviving fish undergo excruciating decompression. The intense internal pressure ruptures their swim bladders, pops out their eyes, and pushes their esophagi and stomachs out through their mouths. Then they are tossed onto deck where they are slowly suffocating or dying squeezed. Others are still alive when they are cut and butchered. "Sport" fishing is angling, but can also include bow and arrow, net, spear and gun. For demands of fishing industry, "sport" and "recreational" angling billions of fish yearly are subjected to intense pain, fear and dying in agony. Their death is called catch, and it is not measured in the number of killed individuals but in tones. Fish on aqua-farms spend their entire lives in cramped, filthy enclosures, and many suffer from parasitic infections and diseases. Aqua-farmers use powerful chemicals and antibiotics in an effort to make fish grow faster. Eating fish is not healthy! Around the world, fish are accumulating toxic mercury and heavy metals in their flesh as a result of industrial pollution. Several thousands of people die every year as a result of seafood poisoning. The World Health Organization has advised women of childbearing age and young children not to eat certain fish that are known to contain alarmingly high levels of mercury, which is proved to damage the developing brain of a fetus and also the brain functions of adults. By measuring the level of mercury, arsenic, lead, and cadmium in fish and other cetaceans in the Adriatic Sea, it is confirmed their significant pollution. Fish, as well as meat of other animals, contains cholesterol. Plant based sources of Omega-3 fatty acids are much healthier option. Croatia not only devastates the Adriatic Sea with trawlers, but also pollutes the environment with aqua-farms. Due to over-fishing, thousands of living organisms are exterminated. Commercial fishers have devastated the ocean’s ecosystem to the extent that today oceans and seas are ghostly nothingness, which barely remind on times when they were full of life. We invite the citizens to stop eating the inhabitants of lakes, rivers, seas and oceans and to consider vegetarianism as a compassionate way of live towards all living creatures with whom we share this blue planet.